Complete your outdoor watering tasks quickly and easily using this DRAMM Green ColorStorm Premium Rubber Hose, Brass Quick Disconnect, and Shut-Off Valve kit. This package provides a fantastic, durable garden hose, as well as two heavy duty connectors, for use throughout the seasons. The lasting DRAMM Green ColorStorm Premium Rubber Hose resists kinking, thanks to its hexagonal body, and its green color adds a fun hint. The EPDM rubber body may be used with water up to 160° Fahrenheit, and remains flexible in temperatures as low as -25° Fahrenheit. Its 50' length is perfect for most laws, and the nickel plated brass couplings on each end are a standard size for compatibility. Attach the included DRAMM Brass Quick Disconnect Kit to one end of the hose or spigot, making changing accessories simple. The package includes one female and one male fitting, while their all brass construction lasts for many seasons without rusting. To control the water flow at the end of your hose, attach the included DRAMM Brass Hose End Heavy-Duty Shut-Off Valve to it. The ergonomic handle on this brass accessory may be moved with just one finger, diminishing or stopping the water flow quickly and easily. The threaded base of this piece affixes to the hose end in moments, and its brass body ensures durability. 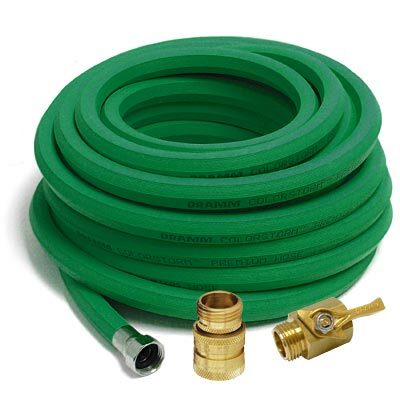 Water all your plants quickly and easily with this Green ColorStorm Premium Rubber Hose, Brass Quick Disconnect, and Shut-Off Valve kit. Hose and quick disconnect kit made in the USA. Lifetime guarantee on hose.